Myer’s Original Rum is a grocery store staple – I can’t imagine it not being available most anywhere. Myer’s Legend, on the other hand, is a rare prize. Compared to its more common cousin, Myer’s Legend is less bitter and less coppery. It’s warmer, smoother, and in a nicer bottle. That last comment about the bottle isn’t meant to be snide. Drinking rum is about the entire experience – and that experience begins with the bottle. Short and wide like its seagoing ancestors, the Myer’s Legend bottle is wrapped in cord which contrasts beautifully with the dark brown glass. The rum that pours forth has a gravity, but not too much so. It smells faintly of molasses, but mostly this is rum – plain and true. Myer’s Legend can be largely defined by what it is not – it’s not overly heavy or sharp. It’s not bitter or complex. But it is dark, and it is rum. It’s a dark rum, free of pretense or distraction. This pure simplicity makes it a treat, but one that’s best enjoyed in moderation. Not only would it get boring as a staple rum, but I also found it a little too anxious at inducing hangovers – even two small glasses left me with a lightly nauseous headache the following morning. That said, when you’ve been cruising through the world of rums for some time, experiencing everything from the complex to the exotic to the downright deadly, a glass of Myer’s Legend Rum can be a delightfully centering experience, reminding you of what rum – beneath all the subtleties – should be. Myers’s Original Dark is a staple for mixologists, but never was really intended as a sipper. 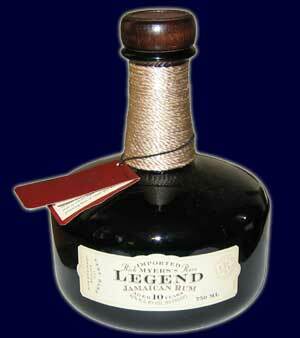 This well known dark Jamaican rum is a must own for mixed drinks. Although Sue Sea and I then proceeded to taste and review many, many more rums somehow that tempting bottle of Myers’s Legend (aged 10 years or more) never culminates in actually buying it. Finally, we simply ran out of rums to reviews and yesterday I bought the Legend, at a wallet emptying $40, never discounted. I’m so glad I did. Your review is exactly what we experienced, and for the very same reasons. Legend is complex, but not over so. It has elements of sweetness, but not overly so. Some bitter chocolate of coffee, and many other deep and rich impressions. As Sue Sea puts it: “This is a dangerous rum”, meaning far, far too drinkable. This is a classic, pot-stilled Jamaican rum that reeks of smooth tradition. It may be the definitive dark rum. Great review, and even though you don’t always publish my brilliant commentary, lol, we love ya and respect ya! Found a bottle of this stuff. Don’t know much about rum. Thought some one may appreciate more than me. I think it is rare now. Don’t know if anyone would like it. Or I’ll just drink it and enjoy. Help! I cannot find Myer’s Legend, aged 10 years…and it is a staple for making Rum Cake at holidays…no other rum makes the recipe turn out correctly;y. Where can I find a bottle? Or two or three? Thanks!It’s good in mixed drinks too.